Now that our CSA bins and farmers markets and highway produce stands are overflowing with summer’s bounty—though it’s still not too late to sign up for a CSA fruit share; here in New York, I signed up yesterday with Red Jacket Orchards, which has done wonders for my despairing over how fast the summer has gone (the fruit shares will deliver through early November! )—there’s no better opportunity to put your vegetables to task. With that in mind, I decided to try a new recipe, something that would take care of all the zucchini and yellow squash I have on hand. 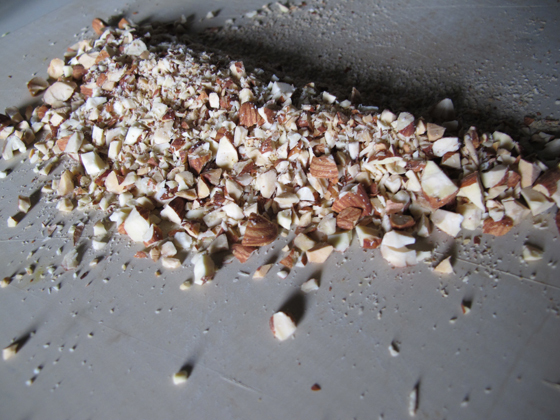 I think I was late to the game in my most recent flavor-combination discovery: Zucchini and Almonds. What a revelation that was, how the almonds round off the squash into something mature and sweet-savory, as well as adding that much needed crunch. That’s where I took my cues when I started working on this simple burger. For bright, minty contrast I threw in some basil. And I pretty much left it at that. Here’s a burger that—like most veggie burgers—has lots of room for improvisation. Play with the herbs. Grate up a parboiled potato and substitute it for one of the zucchini. Veganize it and use egg replacer instead of egg—or try working in a steamed potato. And then go crazy with the toppings. Here I’ve piled pickled red onions, a cute heirloom tomato, and lettuce on a bun, but there’s no one to stop you from adding cheese, or pico de gallo, or pesto, or bean sprouts. You could also could try these on the grill if you’d like. Just be sure to cook them on a double-layer of foil; the mixture is loose enough that it will fall through the grates. 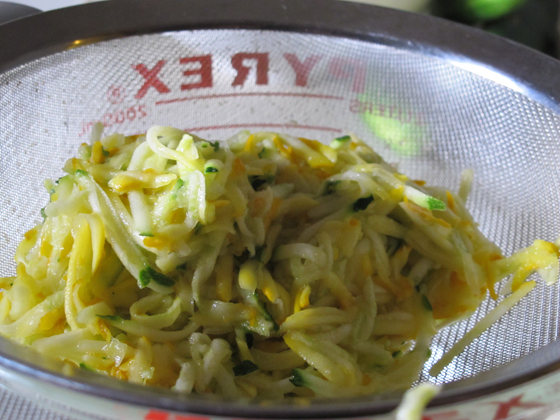 Preheat the oven (or toaster oven) to 350° F.
Grate the zucchini on the bias so as to create larger strands, using the large holes of a box grater. Toss with the salt and then leave in a strainer for 15 minutes. Using your hands or by wrapping the zucchini in cheesecloth, squeeze out any excess liquid. 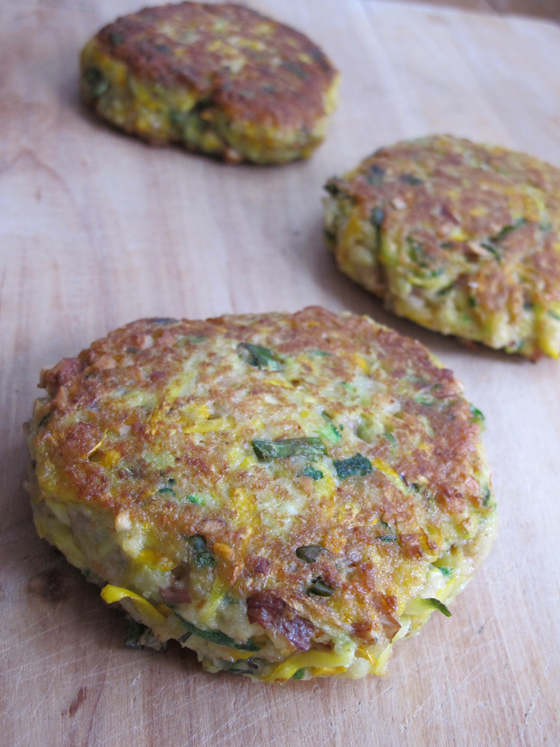 Combine the zucchini with the almonds, basil, flour, egg, and black pepper. Add the bread crumbs, adding more if the mixture hasn’t become pliable. (It will be a very wet mixture, though.) Shape into 4 patties. Heat the oil in an oven-safe sauté pan over a medium flame. Cook the burgers, 2 to 4 minutes per side, until golden brown. Transfer the pan to the oven and cook for 12 to 15 minutes more, until firm. Thank you for the recipe! 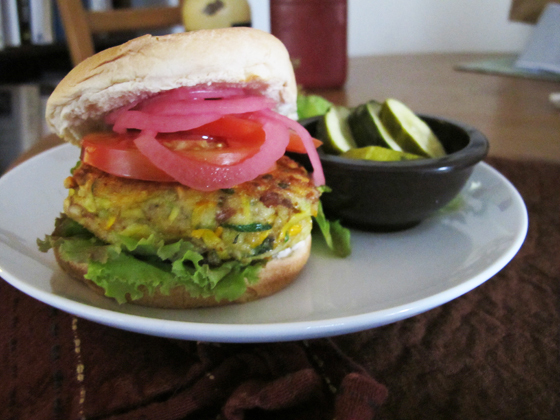 I am on a gluten free diet and I longed for my old veggie burgers. They all contain wheat so I had to abandon that. I will adapt this recipe with GF ingredients. What a good idea! I finally got around to making these last night! Zucchini is my favourite veggie so I’m always looking for new ways of making my friends eat it too! The almonds were great. Thanks! Thank you! I’m glad to hear! I made these burgers from a vegetarian cook book. I can’t tell you how DELICIOUS they were! I ate it between freshly baked Spring Mill 7 grain crunch bread. It must have been my Vegetarian Entrees that Won’t Leave You Hungry! I love this recipe, too. Such a good one for summer.